The Scottie Mom pups are pros when it comes to cheesing for the camera. When it comes to video, however, not so much (but we're learning!). 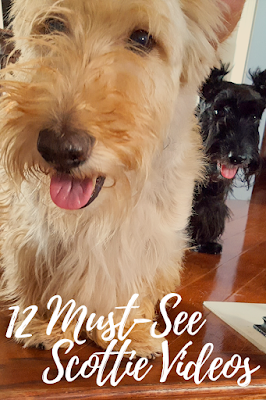 So, until we master the art of video production and you can watch their adventures in motion pictures, I decided to do some "research" and scout out some of the best videos of Scottish Terriers out there right now. Here are the first round of Scottie Mom video awards...think you have one we'd all enjoy? Feel free to send it our way! First up, the Synchronized Scotties Award goes to...(and no surprise here) the Scottie Pinwheel! 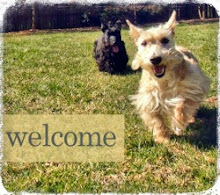 By now, I'm sure every Scottie Mom has seen this video but shortly after their claim to fame, these adorable pup grew up and before long, they were ready for their new homes. Check out their "Scottie Pinwheel Farewell" video. Next, we have the Best Drama Award which goes to the western short film, "Scottie Tails Shoot-out." It's all up to the fastest paw in the West out when Scotties Boone and Kenzie disagree. Hands down, the Best Scottie Dog Dupe Award goes to Scotties Guinness and Fenway, who think they're going for a W-A-L-K when they hear the words spoken from a computer. Watch their reactions. The World Travelers Video Award goes to...Kenzie and Boone of Scottie Tails! These pups have seen more of the world than most Scottie Moms! Watch their globe trotting adventures. The Most Unexpected Award goes to: Scottish Terrier and Kitten Play. A Scottish Terrier is so distracted by a toy that the silly pup isn't even bothered by a C-A-T on the floor beside her. Even more surprising, this cute pup backs out to let the C-A-T play for a bit! Basil the Scottie can not only ArRRroOo, but he can have an entire conversation with his hooman ArRRroOo-ing, earning him the Best ArRRroOo Award. Check out how he communicates. Next up, we have the Sweet as Pie Award, which goes to Baby Scottie plays with Tomato. Sounds strange but watch it and see how cute a little pup swatting a tomato across the floor can be. Forget Snow Angels. Let's see some Snow Scotties! The Snow Scottie Award goest to Lana, who loves some fresh snow! Watch her in action. 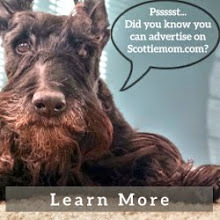 Ever cross a Scottie that didn't want to do what they were told? Try telling Frida she's going to get a bath! See how she reacts and why we're giving her the Best Scottie-tude Award. This Scottish Terrier knows the secret to a deep slumber. Find out what you need to get some serious rest and relaxation by watching the Scottie who wins the Best Bedtime Ritual Award. To wrap up this round of awards, we present the Best Action Award to Hitchcock the agility Scottie! Check out his moves. Prepare to be WOW-ed (or ArRRrOo-ed). Here's one of Kenzie and me (just before Kenzie passed) chasing away the pool monster. I have never laughed so hard, and smiled so much, as I did watching these films. Thanks for the great production of the Scottie Awards. My fave, if you must know, is the western drama....oh-so-funny! Kyla, I know you miss Kenzie but it is so wonderful that you have this adorable film of the two of you together to keep old memories alive. Yeah, I miss Kenzie. Then again, I'd never would have met Kaci and she would have did the kill-shelter thing and that's not right. bol! Those are some GREAT videos! !